Ubisoft's buddy-buddy relationship with Nintendo appears to be getting even deeper, as it was announced at E3 2018 that Nintendo's Starfox is coming to Starlink: Battle for Atlas. 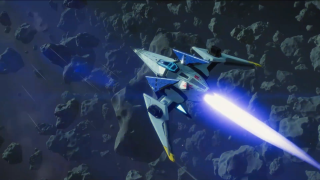 Starlink: Battle for Atlas is the toy-based video game that Ubisoft announced at E3 2017. This year, they showed off even more of the game and the connected figurines that go with it. They ended the showcase with a sneak peek at Starfox's cameo appearance in the game. Starlink will be launching later this year on October 16. It will come to PS4, Xbox One, and Nintendo Switch. But, Starfox will be a console exclusive tied to the Nintendo Switch version. This announcement followed shortly after the preview of an expansion to Mario + Rabbids Kingdom Battle that will include Donkey Kong.